The bitterly cold October winds inspire us to come up with the best spooky ways to scare our neighbors. We try to recreate the creepiest houses on our blocks from when we were kids. Old Man Johnson’s house, with the gravestones out front. That memorable year Mrs. Barnes covered her house in bloody handprints. Now it’s your turn to freak out the neighborhood. You’ve done the gravestones, and you are NOT painting your house with bloody handprints, even though it was awesome. This year you've got to up the ante, do something that you've never seen done before! 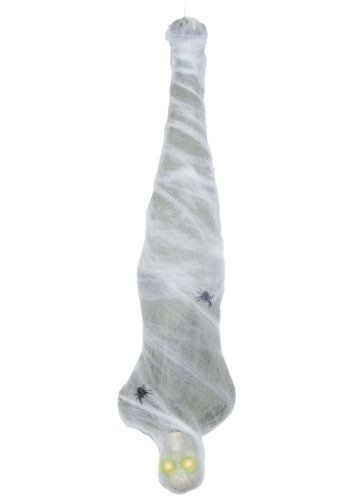 Yes, this year you need something like this Light Up Cocoon Man. He hangs with ease from a loop and has glowing LED lights that blink red. You can transform your beautiful home into an insect's wildest fantasy. Go hog wild. Surround this cocoon man with cobwebs, spiders, hanging moths. Don’t be surprised if you win this year's “Creepiest House” contest!